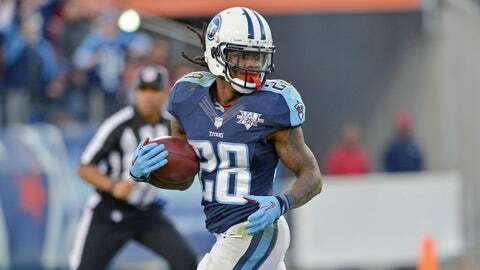 Tennessee Titans running back Chris Johnson is struggling through his worst year as a pro. Nobody seems to have informed Johnson of his regression to the mean, however, and the well-compensated former star says he’s unwilling to let his declining output on the field be reflected in his paycheck. His fault or not, it’s been a steady fall from the top over the last few years for Johnson, who led the NFL in 2009 with 2,006 rushing yards, but saw that number drop to 1,364 in 2010 and 1,047 in 2011 before a slight resurgence with 1,243 yards last season. This year has been Johnson’s worst as a pro, and if he can’t pick up 50 yards against Houston — he’s been held under 50 yards in seven of 15 games this year — he’ll miss the 1,000-yard mark for the first time in his career. But Johnson — who pocketed $10 million this year and is scheduled to fetch $8 million the next two seasons and $7 million in 2016 — isn’t willing to place the blame for his own struggles on himself. “I know I am way better than trying to get 1,000 yards in the last game,” Johnson told The Tennessean. And if that “right situation” turns out to be with another team, the 28-year-old Johnson and his inflated sense of self-worth to be fine with that. • A Houston Texans linebacker had brain surgery two years ago and managed to keep it a secret, until now. • The Miami Heat roster includes a few underwear models. • Robert Woods was fined $15,000 for “being a man” and punching Reshad Jones. • You can buy the jersey Christian Laettner wore for “The Shot.” Bids start at $100,000. • Beno Udrih blamed a bad shooting day on his jersey sleeves. • Here is how your Gator Bowl matchup was made.